Flying to Europe tonight! Haven’t packed, haven’t changed $ haha. Oops. I really function best during the last minute- this is not an excuse! Packing is becoming more and more of a chore to me, and I really dread it especially since going for exchange. The friend said she enjoys thinking about what she would be wearing everyday but nope, not me. That said I’m pretty sure the travel bug will hit me once I land in Zurich. As of now- still tired and dreading the flight. To excite myself a bit more, I decided to edit some photos of my winter vacation last year during exchange. The friends and I stopped over at Berlin for quite a number of days. I hate having a packed schedule- I would rather work with less than try to pack a million places to visit for a holiday. I was glad the friends were on the same page as me in that we didn’t want spend a lot but we were willing to splurge occasionally on a good meal or make accommodations for spontaneous decisions to spend 😉 Berlin wasn’t too hard on the pocket anyway with its cheap and good accommodation. We stayed at Wombats – three beds in a 4-person room with an attached toilet. In the end there was no 4th person so we had the whole room to ourselves. Berlin is largely rebuilt, modern, devoid of any pretty, ornate architecture that we commonly see in many parts of Europe. A city scarred by its past- but this past also draws hordes of tourists, and forms the collective identity of Berliners. 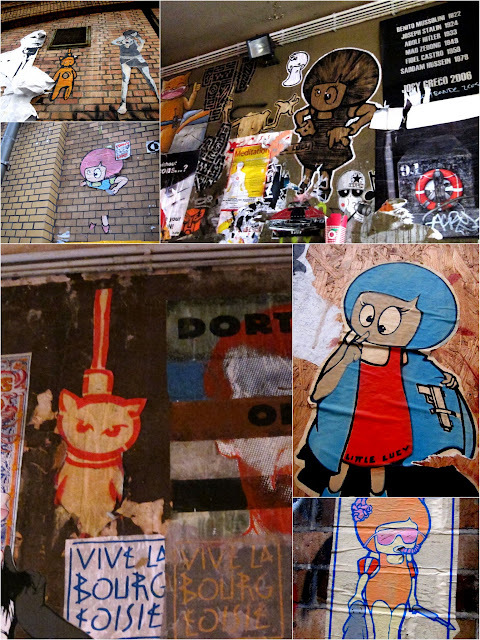 It was interesting to see how street art had flourished since it was first proliferated by the West Berliners. Whatever the motivations behind what I saw- political, a point of view, or simply for the fun of it- I appreciated them for the colour and life they brought to the streets. The level of detail, quirkiness, and the fact that it’s “illegal” but celebrated made the street art in Berlin really special for me. One of my favourites was “little lucy” by El Bocho simply because it’s fun- though in a violent way (think happy tree friends). Spot Lucy’s dead cat! This one was special because we saw him working on this. He attached the tile with a glue gun and casually leaned against it like an innocent passer-by. Clever! This was commissioned, not illegal. Hence the elaborate detail and beautiful texture from the brushstrokes. Dmitri Vrubel and the famous Fraternal Kiss, Leonid Brezhnev and Erich Honecker in a fraternal embrace.